In 1978 the theatre was purchased by a non-denominational church and was used for their weekly services until they built a new facility, and no longer needed the structure in downtown Stuart. At that time, in 1987, a downtown redevelopment effort was underway. 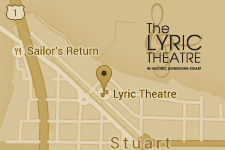 A group of community minded individuals, FRIENDS OF THE LYRIC, INC., saw THE LYRIC THEATRE, situated in the heart of downtown, and realized there was an opportunity to save a historically significant structure. With assistance from community grassroots efforts and grants, The Lyric underwent much needed repair to stabilize the building. In addition to all the cosmetic improvements The Lyric made, they have added a new line array sound system, a digital sound board, and a 9-foot concert Steinway piano. The LYRIC THEATRE seats 500 and has a 22'X30' stage and features whisper-perfect acoustics. This grand old theatre represents a colorful history in our community as a central gathering place for young and old alike.